We offer our clients with qualitative sauna heaters and sauna control panels which are made using top graded electronic components. To operate all our heaters a specified control panel is provided for easy access. The sauna heaters and sauna control panels can either be designed together or separate so that it can be mounted outside the sauna. Free standing sauna heater for heavy duty commercial use. 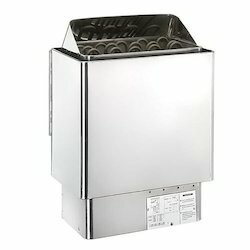 An extra heavy duty free standing sauna heater in stainless steel. guarantee. Please note the controls are supplied separately if required. wiring using high temperature Teflon cable. (not included). upon the distance between where you locate your switch and the heater. For heavily insulated cabins larger volumes will be possible. i.e. 100mm insulation all around the cabin. 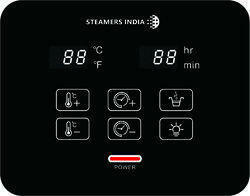 Our range of top quality sauna heaters and sauna control panels are acknowledged in the market for its high performance. All of the heaters come with the Digital control panel to operate them. Mechanical controls can be built-on to the heater, or separate, for wall-mounted outside the sauna. We also provide the digital controls for more features and better control of your sauna environment. Sauna heaters range from 12 KW watts heater. We have Original LAVA sauna stoves for all sauna requirements, residential or commercial applications. Available in different specifications these heaters and control panels can be customized accordingly as per the specification set by the clients. Specially Design For Good Sauna. Available from 3kw to 9 kg capacity. We set out to a true Commercials Saunas heater with no compromises and only the best materials for the commercial series sauna heater. The body is made entirely from stainless steel which will stand up over time looking as beautiful as the day you purchased it. 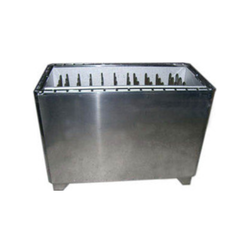 The rock tray capacity is easily one of the largest in the industry so that when you pour water over the stones a rush of steam is instantly released. Finally, The heater element that is built to commercial specifications to ensure they are the longest lasting in the industry and still provide fast start up times. pour water over the hot Sauna stones to create instantaneous steam. This sauna heater is ideal for using essential sauna fragrances which offers a tremendous amount of unique health benefits. 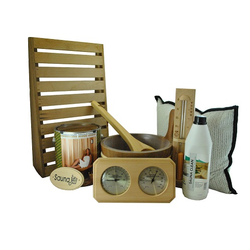 Creating this sauna environment with essential oils will allow the sauna bather to enjoy a perfect sauna experience. 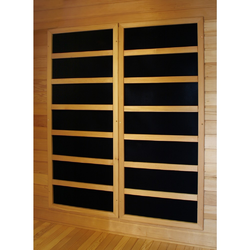 This sauna heater offers the largest rock tray capacity compared to any other sauna heater available today. We take great pride in announcing that we are one of the leading organizations involved in offering a range of Sauna Accessories. To furnish the wide requirements of the customers, we are offering a high-quality range of Infrared Sauna Carbon Heater. 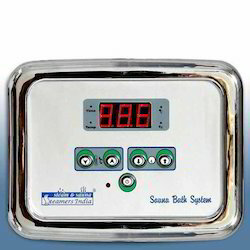 Model ST2-101 Sauna controller Kit is equipped with our latest New Generation Sauna digital control panel. You can adjust the temperature of the Sauna room and set the working time of the Sauna heater as you wish. 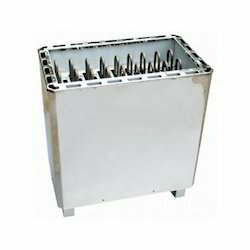 And the system contains a Triple overheat-burnt protection system and a security High Limit Switch to cut-off heater load. it could prevent the overheating and assure the Sauna furnace working at a regular air Temperature. It has the reasonable design and working very stable, very convenient to install, healthy and comfortable, is the top grade sauna equipment for the modern family, 5 STAR Hotels, Gym, Commercial Sauna and the Society club House.